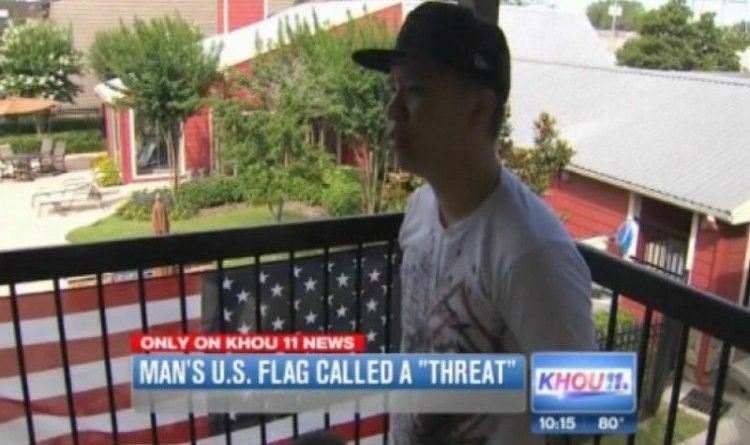 A Texas man claims the manager of his apartment complex told him to remove the American flag from his balcony, calling it a “threat to the Muslim community. “I’m not a threat toward anybody,” Duy Tran, who moved into the complex a few days ago, told CNN affiliate KHOU. The complex’s manager denied the station’s request for an on-camera interview and handed a reporter the following statement instead. Duy Tran had just moved into the new apartment, and he wanted to put up a flag to honor his friends who have fought for our country. He was stunned when he was told he could not do so because it might offend Muslims. “It’s not a threat to anyone,” he lamented. Mr. Tran said he refuses to take down the flag that he says means so much to him. That’s right. They said they wanted the American flag to be removed because they found it wasn’t ‘aesthetically’ pleasing. I’m not sure who that company thinks it is to say our flag, the American flag is not good enough to be displayed in public. If Muslims don’t like our US flag then get the hell out of our country and go back where you came from! SHARE this story if you think ALL Americans should be allowed to display the American flag!